05 Aug 2018: A One-Day National Seminar was organized by ELT@I Chapter Rajnandgaon on “English Language Teaching in Rural Area” at Govt. L.C.S. College, Ambagarh Chowki under the super guidance of Prof. B. K. Patel, Prof. Shailesh Kumar Mishra, and Prof. Niresh Kurre, Secretary of ELTAI Rajnandgaon Chapter, where 170 participants from different corners of Chhattisgarh and other states of the country took voluntarily participation in the seminar. On this occasion Prof. B. K. Patel (Principal, Govt. Naveen Mahavidyala, Janjgir Champa, Chhattisgarh) was the Chief Guest; whereas Dr. K. R. Mandavi (Principal, Govt. L.C.S. College Ambagarh Chowki, Rajnandgaon Chhattisgarh) was the Chairperson. 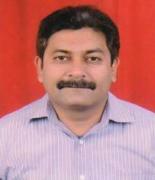 Prof. Shailesh Kumar Mishra (Head of the Dept. of English Patan College, Durg Chhattisgarh), Dr. Nitesh Kumar Mishra (Head of the Dept. of Ancient History Pt. R. S. S. University, Raipur, Chhattisgarh) were the Special Guests. In his keynote address Pro. B. K. Patel said that Teaching English in rural area of the country is indeed a herculean task and the teachers, who are teaching in rural areas, are the true soldiers of the country. There is a huge demand of English around the world at present and we can’t go ahead even a single step without its use. Whether it is education field or the corporate sectors, one can see the importance of English all around. Dr. K.R. Mandavi said that English is not only a language but also the life line of present days’ culture and civilization. Prof. Shalilesh Kumar Mishra spoke that English is the language of use. In rural area maximum use of English by the teachers as well as the students can make the task easy of teaching English. Dr. Nitesh Kumar Mishra said that there is a co-relation between human development and human language. 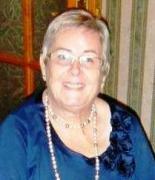 In this regard English has become the most useful language of the world because of its maximum use. In valedictory session Dr. 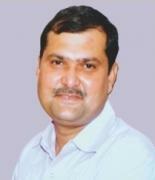 I. D. Tiwari, the Chairperson of the Session (Head of the Dept. 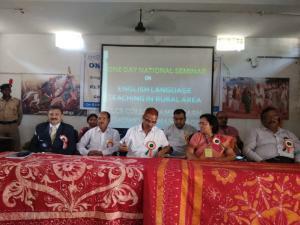 of English, Indra Kala Sangeet Vishwavidyalaya, Khairagarh) said that teachers who are working in the villages and remote areas of the country need special attention and English language related trainings to become expert in this field. Ex-executive officer Mr. Heera Lal Shende, Mr. Pushpa Sinha (Chief of Aktash Mahila Evam Bal Kalyan Sansthan, Lal Bahadur Nagar, Rajnandgaon) also addressed the audience. About 20 research papers were presented including Dr. Madhu Kamra (Raipur), Dr. Anita Shankar (Rajnandgaon), Dr. Chandrashekhar Sharma (Durg), Dr. Shila Vijay (Bhilai). Mr. Sanjay Manikpuri (Nagpur), Mr. Suresh Kumar Gupta (Surajpur) and Prof. Ram Prasad Kujur (H/E Indra Gandhi Krishi Vishwavidyalaya Raipur) were given the best paper presentation awards. ELT@I Rajnandgaon Chapter thanked all the executive members of the National body, especially Dr. S. Rajgopalan, Dr. K. Elango, Dr. Shravan Kumar, for their positive remarks and positive thinking.